Teenage Mutant Ninja Turtles was created in an American comic book published by Mirage Studios in 1984 in Dover, New Hampshire. The concept arose from a humorous drawing sketched out by Kevin Eastman during a casual evening of brainstorming with his friend Peter Laird. Using money from a tax refund together with a loan from Eastman's uncle, the young artists self-published a single-issue comic intended to parody four of the most popular comics of the early 1980s: Marvel Comics' Daredevil and New Mutants, Dave Sim's Cerebus, and Frank Miller's Ronin. 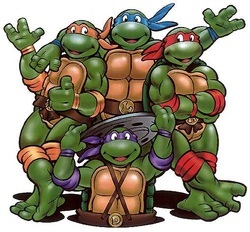 Much of the Turtles' mainstream success began when a licensing agent, Mark Freedman, sought out Eastman and Laird to propose wider merchandising opportunities.Much of the Turtles' mainstream success began when a licensing agent, Mark Freedman, sought out Eastman and Laird to propose wider merchandising opportunities for the offbeat property. In 1986, Dark Horse Miniatures produced a set of 15 mm lead figurines. In January 1987, they visited the offices of Playmates Toys Inc, a small California toy company who wished to expand into the action figure market. Development initiated with a creative team of companies and individuals: Jerry Sachs, ad man of Sachs-Finley Agency, brought together the animators at Murakami-Wolf-Swenson, headed by award-winning animator Fred Wolf. Wolf and his team combined concepts and ideas with Playmates marketing crew, headed by Karl Aaronian and then VP of Sales, Richard Sallis and VP of Playmates, Bill Carlson. Aaronian brought on several designers and concepteer and writer John Schulte and worked out the simple backstory that would live on toy packaging for the entire run of the product and show.